Just wanted to point out that this post was finished on Friday night and sure enough, news broke this morning that Eric Schmidt expects there to be a Nexus tablet in 2012. HP is currently the number two seller of tablets, though most expect Amazon to usurp them in that position (we’ll never know for sure because Amazon doesn’t release sales numbers). HP didn’t become number two (or even number one plus) because people went out in droves to buy the TouchPad for $499 or even $399. HP became number two because they sold the TouchPad for $99 and $149. Amazon is going to do the exact same thing at a $200 price point. Over the past few weeks there have been several articles that argued that Amazon’s Kindle Fire is aiming to take out Android tablets, not the iPad. Amazon is obviously trying to beef up their market share by attracting people with a cheap tablet – they made a $200 tablet in every sense of the phrase. Amazon’s goal was never to take on the iPad. To try and take out the iPad would take a tremendous effort and a premium product. Amazon’s goal was to sell a lot of cheap tablets with minimal effort, which they did. The whole point of a product that you sell at a loss is either to get rid of inventory or to make up sales through services purchased; Amazon is doing the latter. While Amazon’s efforts certainly won’t disrupt Apple’s plans, they could hurt Google. Apple sells a premium product, not a bargain product. Google is trying to do the same thing, but so far tablets like the Samsung Galaxy Tab and the Motorola Xoom haven’t fared as well in sales (Motorola and Samsung make up less than 3% of the market by Gruber’s estimates). It’s possible that products like the ASUS Transformer Prime will gain some traction, but it remains to be seen if any Android tablet can gain significant market share. Even combined, Android tablets are insignificant in market share compared to the iPad. I’m convinced that Google needs to do three things to gain market share in the tablet space: make a halo product, advertise it, and sell it for cheaper than the iPad. Right now the best Android tablet on the market (or at least soon to be on the market) is the ASUS Transformer Prime. The thing that sets the Prime apart from others in my mind isn’t the gaming or the support for a wireless controller or the gorgeous display, but rather the dock. The keyboard dock sets the Prime apart because it transforms the Prime (see what I did there?) into a legitimate productivity device. With Ice Cream Sandwich it will only get better. Google needs to partner with a company like ASUS and make a Nexus tablet. For all intents and purposes the Prime is the Nexus tablet (does anyone think the Prime name was an accident? ), but having an excellent product isn’t enough. Over the last year Apple has increased spending on advertisement from $691 million to $933 million. In the meantime, Google hasn’t run one advertisement about Android tablets. People know about Android phones because the carriers have flooded their stores with dozens of models, but tablets haven’t caught on. Even if people don’t own an Android phone, they’ve seen the commercials or one of their friends uses one. There’s no way to really tell why Android tablets haven’t caught on in the market (much like many journalists are unsure of why Windows Phone still has insanely small market share), but there’s no doubt in my mind that advertisements showing off what these devices can do would help increase awareness if not actual sales. For a long time everyone called all smartphones Blackberries. That eventually shifted to iPhones, but now people know the term smartphone (though many still think all Android phones are Droids…). I think most people still call tablets in general iPads (though I’ve heard some people reference the Galaxy Tab), and with that comes the assumption that the iPad is the only real option. I’ve seen a lot of people walk through a Best Buy and look at Android tablets, but I haven’t seen very many walk out with one. i think part of that is because they’re not sure how to really use one. If people started seeing advertisements for a tablet with people using them, however, that might make people more interested. If people saw how tablets like the Transformer Prime can replace their netbook or how the Galaxy Tab 7 Plus can replace their reading device, they might be more inclined to walk out the door with an Android tablet. I’d prefer Google advertise one halo device, but a good commercial showing off the options that their parters offer could help spur on sales for tablets already in the market. I think Google has done a good job in the past of trying to make technology feel human. Their advertising team sees how their products can help people connect in a way that wasn’t possible before. Android 4.0 is much more human, and Google should be showing that with advertisements for their tablets. They have the specs and now they have the software, but they need the propaganda. People need to know how good Android tablets are before they will buy them. Google has placed the propaganda burden on the manufacturers, but I think its time they stepped up and did it themselves. I think the final step for Google will be to sell a tablet at a $300 to $400 price. This would place the tablet in between the iPad and the Fire in price, but Google could advertise it as better than both. It’s the same argument that Microsoft has made with Windows forever. Microsoft argued that you could get a Windows machine for much less than a Mac. Sure, there’s always been the option for a cheaper system by buying the parts yourself and running Linux, but it doesn’t offer the same experience as a Windows PC. I think the same argument could work for Google. Google has the money to spend on both advertising and on making a product that they could sell for significantly cheaper. If Google really wants to compete with Apple (and I think they do), then they need to step up their game. It’s not enough to partner with Motorola and make a tablet that is bound to a carrier and is overpriced. They should have known from the start that most people aren’t buying tablets from a carrier, they’re buying the WiFi-only version. It’s also not enough to simply rely on the manufacturers to make good products and advertise them well. That plan is obviously not working. It’s time for Google to step up and put themselves in the game with a product of their own. Some worry that if Google starts to do this they’ll push manufacturers to Microsoft. I don’t think that will happen. People don’t want a Windows tablet – they never have. People want a light, fun, productive experience. Android can offer a better product than Amazon and Apple, but at a better price. Google has the power to really shift the market for the better. When they first release Android 4.0 I hoped that we would see a new Google. So far I haven’t seen that, but I hope that Google will step up and make a product themselves. I’m tired of seeing manufacturers fumble around with Android. I’m tired of seeing carriers tie down devices to their networks. 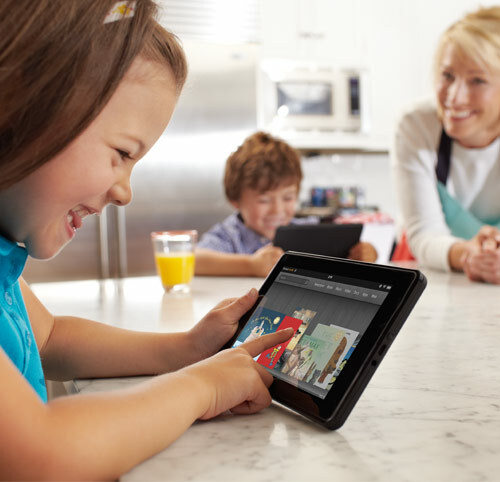 It is time for Google to step up and take control of the tablet space with Android 4.0. What is the HTC Fireball? Headed to Verizon With 4G Soon?